We understand the impact downtime can have on your business, that’s why we strive to get your truck back on the road as quickly as possible. Conveniently located in Fresno, Ry-Den Truck Center is Central California’s medium-duty truck service expert. We´re also the authorized service center for Isuzu and Hino medium-duty trucks. 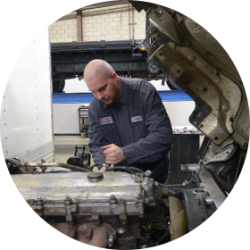 Whether it’s routine maintenance, repairs or warranty service, you can rely on our skilled and certified service technicians to get you back on the road in no time. Contact us today at (559) 441-7667 to schedule an appointment for warranty service or routine maintenance. We’ll make sure your truck’s systems meet all California requirements so you won’t get flagged by the CHP or held up at the scales. Ask us about our DOT Safety Inspections. Did you know that California law now requires the owners of truck and bus fleets to perform annual inspections of their vehicles? To ensure you don’t get fined or cited by the State of California, we’re now offering periodic smoke inspections. This inspection will ensure your fleet is compliant with the Air Resources Board regulations for diesel trucks. For more information or to schedule your inspection, contact us today.